Second post in as many weeks on Indian street food suggests that decent Indian food, since the sad demise (please come back) of Spiceberry, is back on the City centre lunch (and dinner) time menu. Following the success of Chai Street in the Cardiff burb of Canton (a place I have very much enjoyed, but which is not really viable location wise for a work day lunch) I was rather pleased to see them opening up a second branch in the City centre unit that previously housed La Bodega on the High Street (hmmm so where exactly does St. Mary Street end and High Street start?). I had a very nice time at their launch event (thanks again for the great food and drink – those spicy mini meatballs, in particular, were killer), but this post relates to a paying visit for lunch with J (fresh from drinking Dubai dry and a bit depressed on being back in work – must have been bad if she thought lunch with the miserable sod that I am would make a Monday more tolerable). Inside it has a rustic canteen sort of feel to it, with someone with a sense of humour having put up some of the signage. I like the fact it has a semi open kitchen and it seems to me it is a nice place for lunch, to refuel amid a boozy night out or a haven from the horrors of late night Christmas (actually any) shopping. 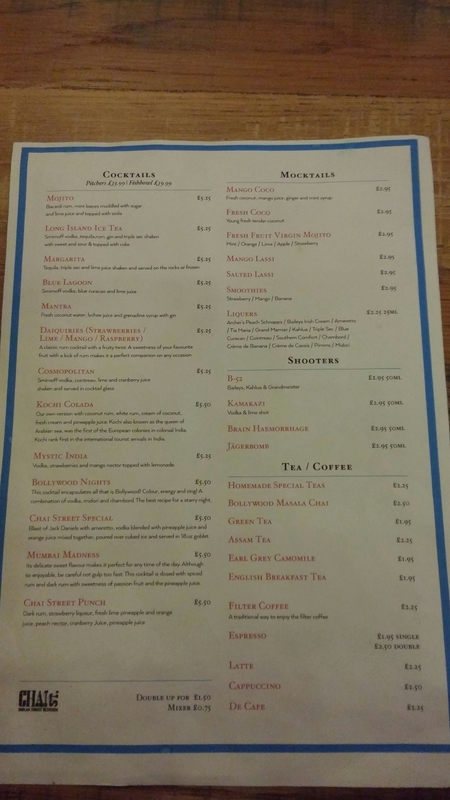 I thought it a nicely balance menu. Great for a quick snack or something more substantial with a few drinks. I went for the biryani pot (£7.50), which came in a rather charming arrangement and with a generous bowl of raita on the side. It wasn’t hot (as in chilli heat), but had some lovely spicing (cumin and cardamom to the fore, but many others in the mix) that really hit the taste receptors. This was real Indian comfort food that was so welcome after I had got totally drenched walking to the place from the office. 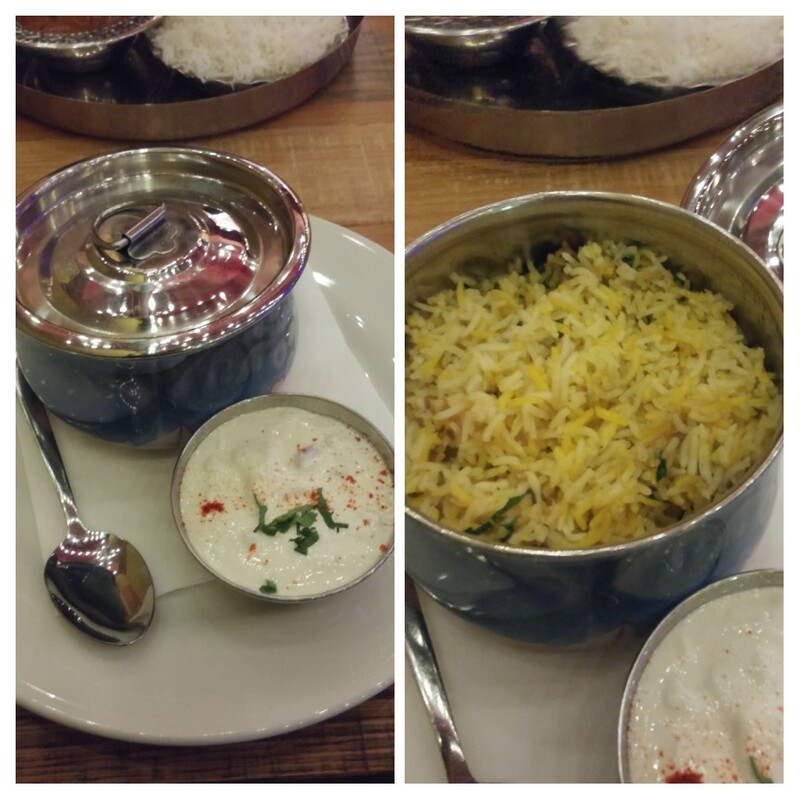 The accompanying raita was first rate and a nice cooling counterpoint to the spice in the biryani. Top notch biryani this, in my opinion, and a step up from the slightly disappointing one last week at Bwyta Bwyd Bombai (other stuff there all very good mind). 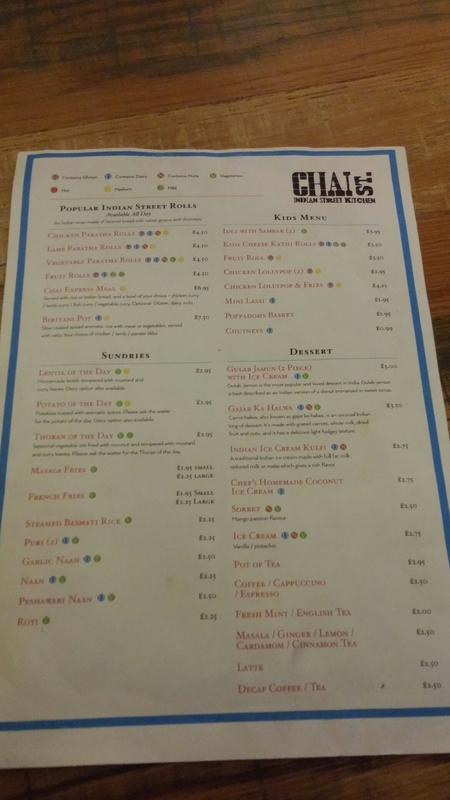 J went for the Chai express meal (£6.95), which offers chicken, lamb, fish or veggie curry with a choice of an Indian bread or rice. Opting for lamb curry and rice, J was very happy with her choice. 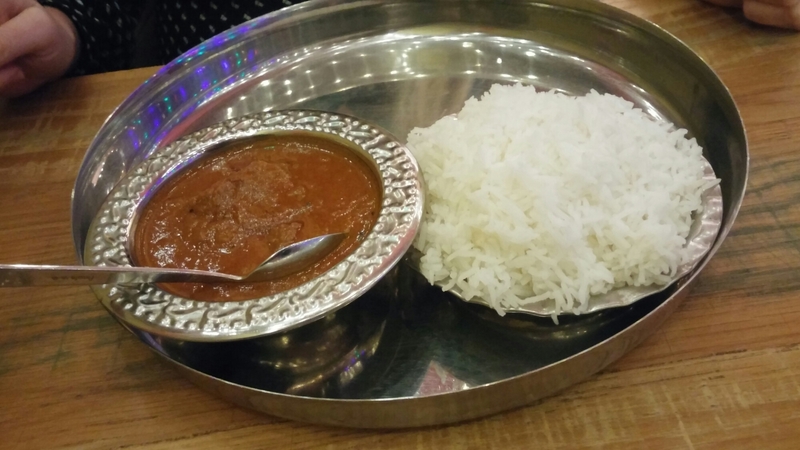 A decent amount of tender, well flavoured, lamb sat in a deep, richly spiced gravy. Touch of heat, but nothing scary and some very nice spicing here. The rice was cooked to a fluffy loveliness. Cracking dish that was just about right size wise for lunch. On the drinks front there is a nice mix of hot, cold, soft and booze. 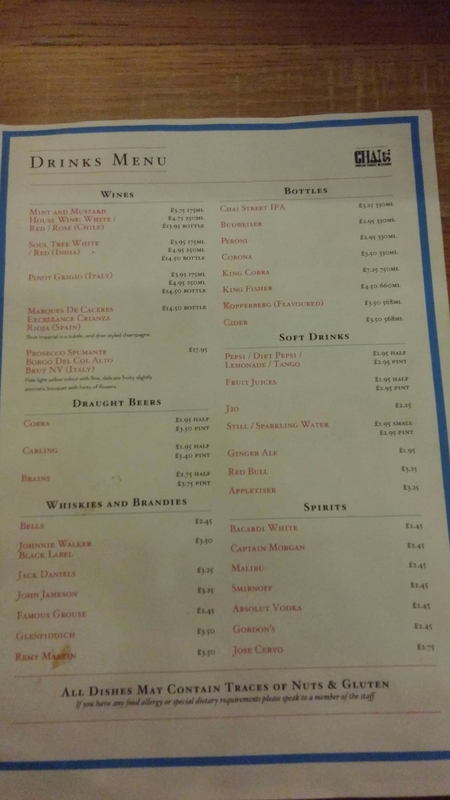 Something for everybody here with beers (draft and bottled), cocktails, mocktails (nice to see a decent selection), wines and spirits, as well as sodas, other soft drink, teas and coffees. 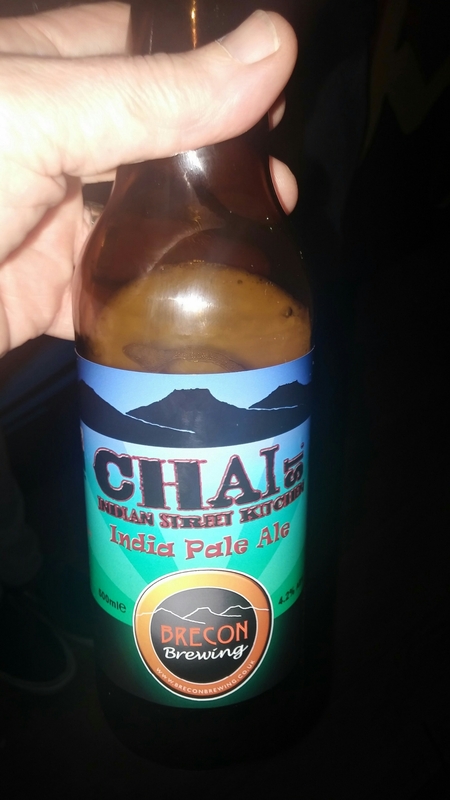 At the launch event I had a couple of bottles of the Chai Street IPA (priced at £3.30 for a 330ml bottle) made specially for them by Brecon Brewing and very nice it was too. There is much debate online as to the suitability of IPA as a match for Indian food and many argue its perceived affinity to Indian food is a fallacy (the word Indian, as the “I” in IPA, not being anything to do with its suitability as a match for curry ) as overtly hoppy beers don’t go with spicy food. I tend to agree with this view where it is a really hop rich IPA, as that can jar with the spices, but this one was quite gentle on the hops and I rather enjoyed it with the food on offer at the launch event. On the wine front, whilst there has been a bit of price inflation since my post on their Canton branch in 2015 (the Soul Tree Indian wine they have increasing in price from £11.95 to £14.5o, personally I think they had got the pricing wrong previously as Soul Tree wines retail at £8.99), pricing is fair with stuff (bar from the fizz at £17.95) at either £13.95 or £14.50 . This represents, for the UK, a very fair mark up. The Marques de Caceres Excellence Crianza Rioja, for instance, is very reasonably priced at £14.50 (as it retails at around the £9 – £10 mark). Still think it is a crying shame no riesling (such a good wine match for spicy food) on the list, but heyho (I always seem to be saying that about the lack of the riesling – it is such a good wine with food). It was a working day and therefore J and I were on the soft drinks. As mentioned above, it is nice to see them giving more than lip service to those not on the booze (designated drivers are well catered for here). J went for a mango lassi (£2.95) and was very pleased (verging on the smug) as to her choice. 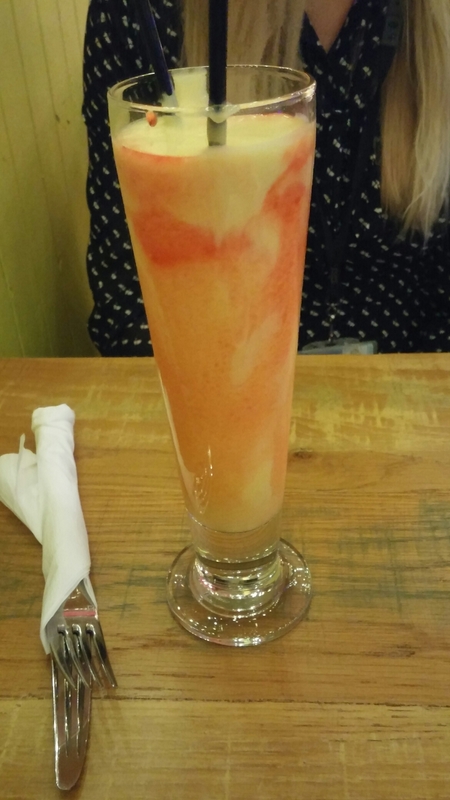 I had a taste and it was thick and fruity and very refreshing. Perfect with the dishes we has. I went for the Bollywood Masala chai (£2.50) with the expectation of something a bit “all singing and dancing” flavour wise. What I got was more Valleywood than Bollywood. It was a bit watery and had a tannic, slightly left to stew, flavour to it. Not really my cup of tea I am afraid. 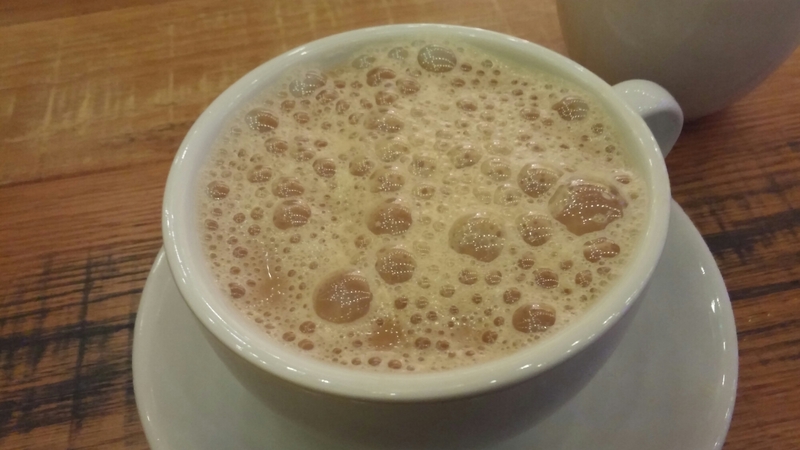 Maybe it is suppose to be like that, but I prefer my chai milky ,with the spices and tea infused into the milk, and for it to be sweeter. I much preferred last week’s number at Bwyta Bwyd Bombai and the karak chai at Gina’s cafe to this Chai Street one. 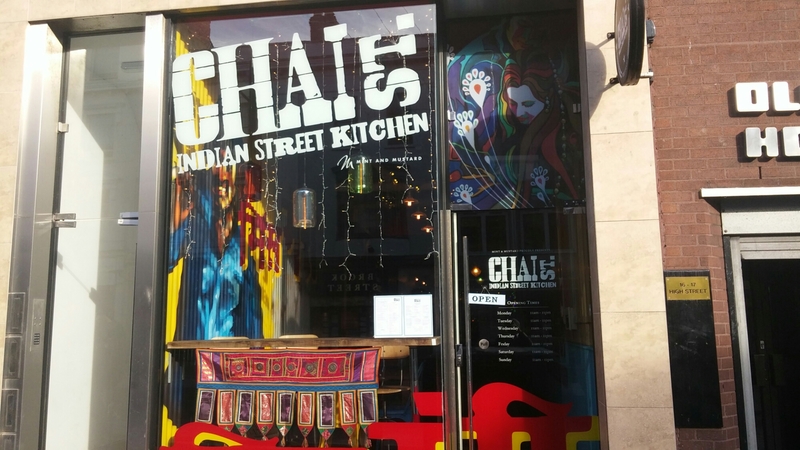 I really liked the Chai Street in Canton and am very happy they have decided to set up shop in the City Centre. Great food and drink (slightly disappointing – at least to my palate – chai aside) makes this ideal for lunch or dinner or a snack in between. 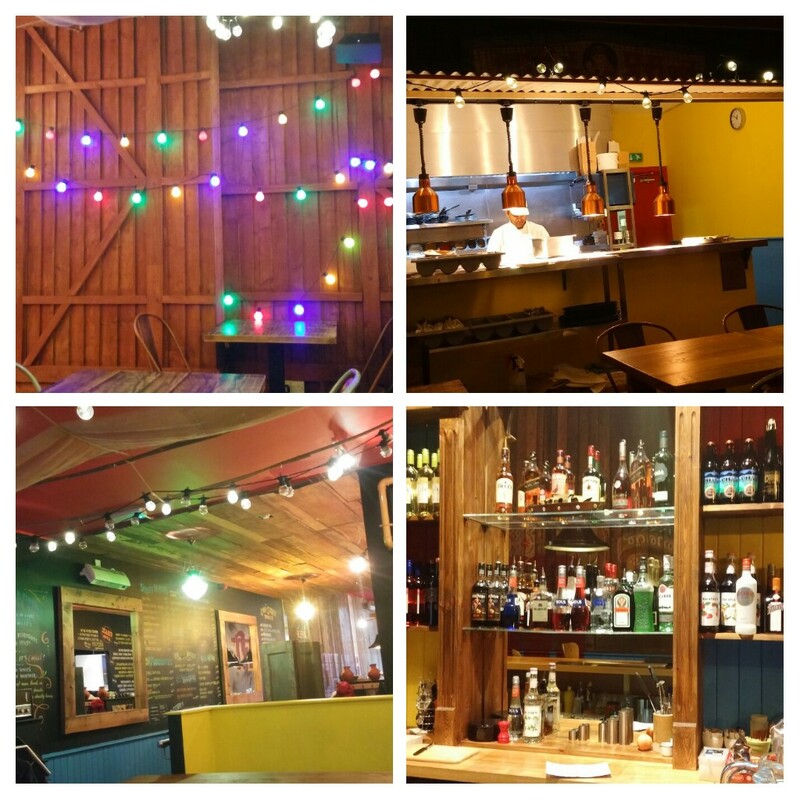 With this place, Gina’s Cafe and Bwyta Bwyd Bombai things are really looking up on the Indian street food front in Cardiff City centre. We paid (sans a well deserved tip) a smidgen under £20 in total which I though very good value for what we got. It is a tradition in my office for big tins of Quality Street to appear at this time of year (I gorge on the toffee fingers, purple ones and caramel swirls – strawberry swirls and orange creams on the other hand are for eating in dire emergencies only, such as post day 100 after a meteor strike or zombie apocalypse – they will still be left in the tin even at that point, with people offered the strawberry swirl saying “Good God it’s not got to that point has it? We haven’t even started on the tail of that decomposed rat over there yet.”). With Chai Street it isn’t just at Christmas you can get “quality street” food – it’s available all year round. Would I go back? Oh yes, great little place. 😃 – is a nice addition to the City Centre. 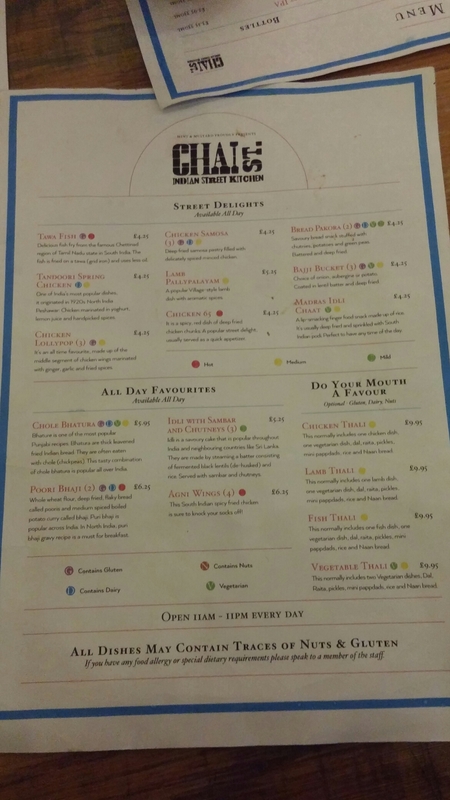 This entry was posted on Dec 4, 2016 by solicitingflavours in Alcoholic drink, Beer, bitter, Bwyta Bwyd Bombai, Cardiff, Cardiff restaurant, Chai Street, Chilean wine, cocktails, coffee, craft beer, Drink, Fast food, fish, Indian, Indian wine, IPA, Kerala, lunch, lunchtime, meatballs, Mumbai, New restaurant Cardiff, Non alcoholic drink, Restaurant Review, review, Sandwich, Tea, Uncategorized, vegetarian food, Wales, White wine, wine mark up, wine pairing.